The lowdown: India and Iran had made a deal to run a pipeline from Iran to India through Pakistan (India would pay a transit fee to Pakistan who would also get access to oil from the same pipeline). Well, the US offered a sweeter deal to India to stab Iran in the back: Vote against Iran in the UN security council and we’ll offer to work with you to build nuclear energy plants. India took the new deal from the US and put off the Iran pipeline crying out about the price of oil and reservations about Pakistan’s control of the pipeline (they knew all along this before they made the deal the pipeline was not going the other way around the globe) and also voted against Iran in the UN in the last two years. Well – India’s energy needs are huge since it is growing rapidly. And at this time it can’t afford to wait decades when it has nuclear power plants. Also India’s parliament shot down the deal with the US. So India decided to go kiss and make up with Iran. The State Department’s Sean McCormack said Monday in Washington that the United States would “counsel against” the pipeline plan. “Given where Iran is in the international system, being under sanctions, and given its actions within the international system, is now really the time to conclude a pipline deal with the Iranian government?” he said. However, insinuations from the United States that India should turn its back on Tehran or use its leverage to pressure Iran into abandoning its alleged nuclear ambitions have not been welcomed by policymakers. For India, good relations with Iran are important for at least three reasons. India needs energy and Iran is the second largest supplier of oil to India, after Saudi Arabia, and a potential source of natural gas in the future; it wields influence in Afghanistan, which India increasingly considers critical to regional stability; and it commands loyalty from India’s substantial community of Shi’ite Muslims (after Iran and Pakistan the third highest population of Shi’ite is in India). Iran and India understand what the warmongering Bush administration does not – that it is trade that brings growth, prosperity and peace to a nation – not wars, threats or voodoo economics like “economic stimulus packages”. This is why India is the number one fastest growing major economy in the world, with a GDP growth rate of 9.4% for the fiscal year 2006–2007. This video has been playing in Pennsylvania markets leading up to Tuesday’s primary. We now are a nation known to start war. We feel compelled because of our insecurity, that we have to go over and attack these countries to maintain our empire. We have over 700 bases — we’re in 130 countries. And they’re talking about bombing Iran. It is such a dramatic change from what is truly American, and truly Constitutional. I don’t want to run the world! The Constitution doesn’t give me the authority to run the world! We ought to mind our own business is what we need to do! With all this spending overseas wasting money! This is a continuation of a revolution. It is a peaceful revolution. It’s up to you to spread this message around this country. This is an American cause, it’s the cause of freedom. There’s something going on in this country, and it’s big! Spread the message! Thank You! Retailers are so desperate for your “stimulus” package – they want to make sure you will spend it in their store and are offering a 10% bonus. Can’t wait for that economic-stimulus check from the IRS? Neither can Sears, Kmart and Fry’s Food Stores. Starting next month, they will give shoppers a bonus to spend the bucks in their stores. Sears Holdings Corp., which owns Sears and Kmart, and the Kroger Co., Fry’s parent, this week announced national campaigns that will allow shoppers to exchange their stimulus checks for store gift cards worth the amount plus an additional 10 percent. Can you imagine these retailers plotting to get the stimulus before the Consumer Spending bubble bursts…..
Click here to read about the Consumer Spending Mirage. Forecasting the stock market is a fool’s game—but there are grounds to believe there’s another drop in the market yet to come. The reason: a broad decline in consumer spending, which so far has been masked by a quirk in the government’s statistics. Combine that with a rapidly unraveling job market, high energy prices, and the continuing credit crunch, and you have the recipe for a drop in consumer stocks. A big decline there could take the rest of the market down with it. Mr. Chairman, I would like to thank you for calling this hearing on the current state of affairs in Iraq with General David Petraeus and Ambassador Ryan Crocker. Reviewing the presentations by our panel, I have noted with some concern that they seem more focused on justifying a future attack on Iran than reporting on progress in Iraq. Much of the assertions about Iran in Iraq seem illogical, others seem intended to inflame the situation with little justification. Particularly, I am concerned about claims that a new enemy in Iraq has emerged with ties to Iran. First we were told that the enemy was Saddam Hussein and his Baathist Party. Then we were told the enemy was the “dead-enders” from Saddam’s former government. Then the prime enemy became “al-Qaeda in Iraq,” a prime focus of the presentation by Ambassador Crocker and General Petraeus last September. Now we are told that the new enemies are mysterious “Special Groups” that are said to have spun off from al-Sadr’s Mahdi Army. If this phenomenon of constantly emerging enemies bent on destabilizing Iraq is accurate and our presence in Iraq keeps generating new enemies, perhaps the problem is the occupation itself. If this is the case, doesn’t it make sense that our departure from Iraq may actually have a stabilizing effect? I suspect these allegations that Iranian-supported “Special Groups” are now the prime enemy are in reality designed to provide an excuse for a planned US attack on Iran or are meant as justification for a permanent US military presence in Iraq. It makes little sense to assert that Iran is funding militias to undermine the Iraqi government. The current Iraqi government may have been approved by the United States, but essentially it was made in Iran. The leading political parties of Iraq, the DAWA and the Supreme Islamic Iraqi Council have close ties to Iran. Leaders of these parties were in exile in Iran until the US invasion of Iraq. Iranian president Ahmadinejad is warmly welcomed in Baghdad by Iraqi Prime Minister Maliki. Why would Iran set up militias in the south to destabilize a government with such strong Iranian ties? I find the allegation that Iran just cannot tolerate an elected government next door to be unsatisfying, particularly considering that Iran itself regularly holds elections where a wide variety of political parties compete for power. It is alleged that the rockets fired into the Green Zone during the recent clashes in Baghdad and Basra were made in 2007 in Iran. Is it not true, however, that if the Iranian government were to actually arm the Iraqi militias, these groups would have more modern weapons to counter U.S. helicopter gunships and heavy tanks? Is there any hard proof that the Iranian government is arming groups in Iraq? There are reports that thousands of US weapons have gone missing in Iraq. If some of these turn up in the hands of insurgents, would it make sense to suggest that the US government is intentionally arming them? In fact, there is plenty of evidence that Iran is trying to prevent the further destabilization of Iraq, which makes sense considering that Iran is next door and would keenly feel the effects of an Iraq fallen into civil war. The Associated Press reported yesterday that the Iranian government has condemned attacks on the “Green Zone” in Iraq. According to other press reports, the government of Iran brokered a ceasefire after recent Iraqi government moves against elements of al-Sadr’s Mahdi Army in Basra. Mr. Chairman, I would like to conclude by again stating my concern that the real purpose of today’s testimony is to further set the stage for an attack on Iran. Congress should make it very clear that there is no authority under current law for an attack on Iran. It is in our best interest to talk with Iran and to work with Iran to help stabilize the situation in Iraq. It is also in our immediate interest to remove US forces from Iraq as quickly as it is safe to do so. Mr. Chairman, I would like to submit several questions to the panel. I know there will not be enough time to answer these, but I want to get them into the record. It is said that we must continue the war because we have already sacrificed so much. But what is moral about demanding even more needless sacrifice of human lives merely to save face for the mistakes of invading and occupying Iraq? Doesn’t it seem awfully strange that the Iraqi government we support is an ally of the Iranians who are our declared enemies? Are we not now supporting the Iranians by propping up their allies in Iraq? If (Iraqi Prime Minister) Maliki is our ally and he has “diplomatic relations” with (Iranian President) Ahmadinejad why can’t we? Why must we continue to provoke Iran, just looking for an excuse to bomb that country? Does our policy in Iraq not guarantee chaos for years to come? It is estimated that up to 2,000 Iraqi soldiers refused to fight against al-Sadr’s militia. Why should we not expect many of the 80,000 Sunnis we have recently armed to someday turn their weapons against us, since they as well as the Mahdi Army detest any and all foreign occupation? Is it not true that our ally Malaki broke the ceasefire declared by al-Sadr by initiating the recent violence? Is it not true that the current ceasefire was brokered by the Iranians, who also condemned the attacks on the “Green Zone”? How can we blame all the violence on the Iranians? Is it not true that with the recent surge in violence in March, attacks are now back at the same levels as they were in 2005? Does Iran not have a greater justification to be involved in neighboring Iraq than we do, since it is 6,000 miles from our shores? If China and Russia were occupying Mexico how would we react? Since no one can define “winning the war,” just who do we expect to surrender? Does this not mean that this war will be endless since the political leaders will not end it – until we go broke, and maybe that’s not so far off? War profiteering is not only for the elite chickenhawks, Cheney, George H.W. Bush, Jim Baker, George Schultz, etc. Even today’s small time lawmakers are in it. This is why our lawmakers keep beating the drums of war. John Kerry wanted to send more troops (and boost defense spending), Joe LIE-berman wants America to attack Iran, Roy Blunt wants all war spending bills passed so that will ensure the war never ends. All because they will profit pretty handsomely from war. Our men will die so these people can profit. The term “cannon fodder” comes to mind. Members of Congress have as much as $196 million collectively invested in companies doing business with the Defense Department, earning millions since the onset of the Iraq war, according to a study by a nonpartisan research group. “I don’t pretend to speak for other offices, but I am fairly certain that no member would consider their personal finances when voting on issues as important as sending our men and women in uniform into harm’s way,” said Blunt spokesman Nick Simpson. The Lockheed Martin stock was given to Blunt’s wife by her mother, he said. Right, that’s settled then…. I’m sure just because they tell us, they are not considering their personal finances which are heavily invested in defense when sending other people’s kids to war against countries that pose no threat to us, we should believe them. Anyone wonder why we’re going to war with Iran (another Muslim country that poses no threat to us)? No matter what our politicians are telling us – their money’s on it. Blackwater Book – A Must Read! I am currently reading the book “Blackwater: The Rise of the World’s most Powerful Mercenary Army.” By Jeremy Scahill. It is like a horror story, fast paced and chilling. Frightening to see how this company operates both inside and outside the country accountable to no one. Today in America, Blackwater USA is not nearly as well known as Halliburton or Bechtel — two mega-corporations making a killing off the reconstruction of Iraq. But it is making its way up there now. The book traces the history of Blackwater USA, the powerful private army that the U.S. government has quietly hired to operate in international war zones and on American soil. It has some twenty thousand troops ready to carry out “regime change” on the fly and hires mercenaries from all over the world – especially ones that were veterans of tyrannical or oppressive regimes such as Apartheid in South Africa and August Pinochet in Chile. This book is truly a brilliant collection of research. Jeremy Scahill has done a terrific job of explaining the history of the founder’s family, town, relatives, political views and ties, etc to what the company’s operations both overseas and domestic look like. There is so much going on today that most average citizens do not have information about. I would highly recommend you read this book. It is very informative and worth reading. 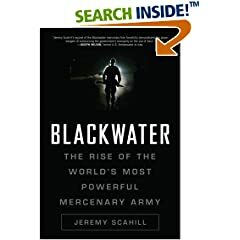 Instead of just reporting on the names and dates, Scahill goes further and explores just why institutions like Blackwater constitute such a dire threat to our government and country. Without any of the checks and balances associated with using our U.S. military and without any allegiance to treaties, standards, or accountability to the American people, these armies for hire represent the ability for money to buy unchecked power in ways we had previously thought could not happen in the U.S.